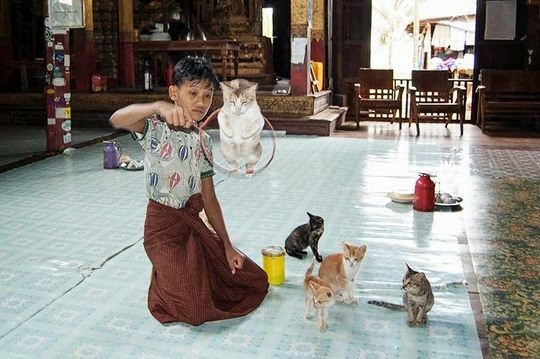 The Nga Phe Kyaung monastery in Myanmar is many a cat lover's dream. 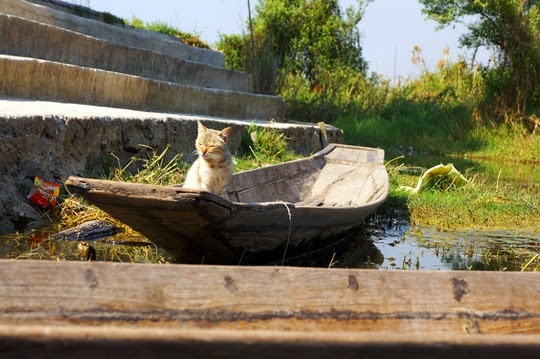 Built on stilts on Inle Lake, the place is known as Jumping Cat Monastery because the monks have trained the local cats to jump through small loops and hold performances. The acrobatic cats are named after Hollywood stars such as Demi Moore, Leonardo Di Caprio and Marilyn Monroe. 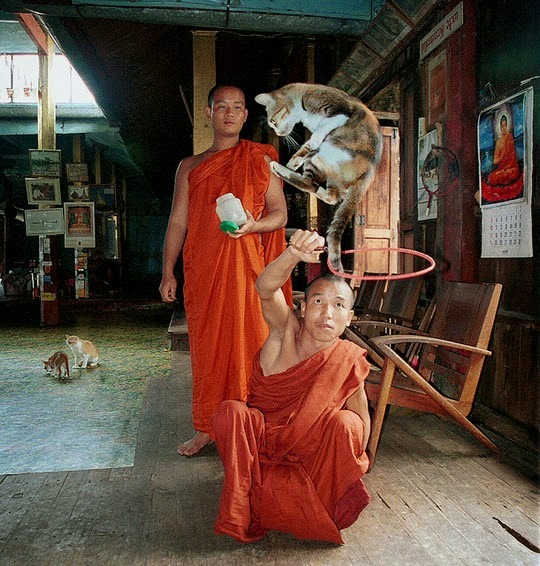 Other pictures of the Jumping Cat Monastery can be found in the book CHATS AUTOUR DU MONDE. OMD those shots are way cool. Have a super Saturday. Jumping Cat Monastery? So cool! Would love to see that! Those really are some amazing kitty captures! Would love to see that. How wonderful. Wow, interesting pictures. I wonder what their training method is. Very cute! Oh wow! Beauty in action! 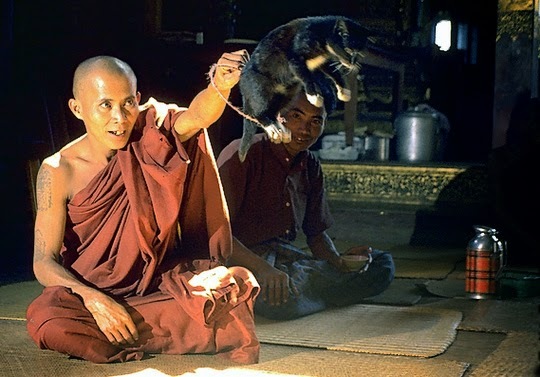 Cats have always had a place in Buddhism. may you ALL be blessed with fortunate rebirths!! Do they have a Tom Hiddleston cat? Si ça n'était pas des moines bouddhistes je dirais quelle horreur. Les chats... ne sont pas des chiens. Mais les bouddhistes sont respectueux de la vie et en recherche de non souffrance. These kitties are very skilled jumpers! Whoa! How cool is this! Those are cool, but I love the one one the boat. This is so precious! Those cats are truly loved to be trained like that! Étonnant ces sauts de chats ! Those cats are amazing! I wonder how they train them? Amazing! We saw a segment on TV about the monks and their cats. Wow. That is awesome! I need to train MY cats to jump through hoops... Love the names! Amazing! I didn't know that about those trained cats. Thank you for sharing. Have a nice day! wow!!! those shots are great. i really love this post. stupendous! cheers!! J'ai été surprise de voir des moines dresser des chats, mais les photos sont étonnantes ! 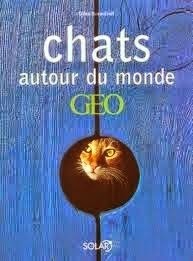 Les chats ne sauteraient pas s'ils ne le voulaient pas ;) Le livre tiré du magazine Géo est superbe, j'ai eu l'occasion de le feuilleter. Wow, those are some amazing cats. Wow! They must have a way with cats that I don't. If I tried to train mine to do that, they'd stare at me like I'd lost it. Amazing! And the kitties are so cute. I see some little tykes in those pics as well. Thanks for sharing!